Hindvasi newspaper is being published since 1917. Many Sindhis in childhood used to get Hindvasi Sindhi Newspaper at our home. Entire family used to read it with a lot of interest. There used to be 2 pages of politics & literature, pages for kitchen related articles by Kala Premlani and Stories and Poems, also there was Devnagiri version of “Balkan Ji Bari”. We would search for the puzzles and solve them. Within half an hour they used to finish reading our favourite pages and then read the rest of the newspaper peacefully. 5 of the homes in row would read this and by that time the new edition would also be published. 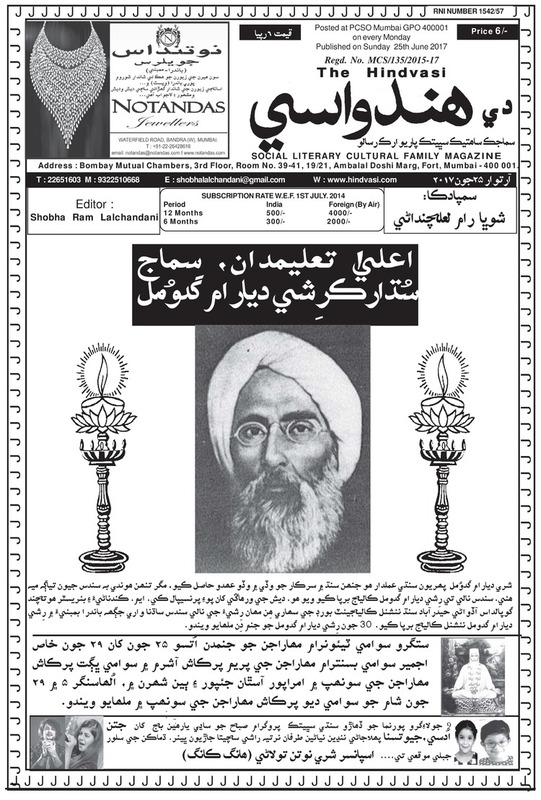 There were hundreds of such publications of Hindvasi Sindhi Newspaper. ← Hindvasi Newspaper - Social, Cultural, Literary Magazine. Hindvasi Newspaper is not only the medium of entertainment and education but has also, time after time, during calamities, supported in bringing together the disturbed generation. That calamity can be an attack by Pakistan or natural disasters. Hindvasi Newspaper has unveiled the informative side of every news. After strong and experienced editors like Hiranand Karamchand and Teerath Sabhani, Shobha Lalchandani is now sincerely shouldering the responsibility with full dedication. Every year on the occasion of Sindhi New Year Cheti Chand, there is cover and back page printed in color, the sponsors advertise, and 6 to 8 editions are printed on glossy paper. Disclaimer: The Hindvasi Newspaper Print copy is published weekly from Mumbai. E-paper access is provided to you FREE as is basis. E-paper conversion process may generate some typos or errors in web publishing.